In course of the correspondence with Mr. Kesler and Arthur, to whom I may thank the whole story, it became evident, that the aged airman was about to return to Budapest, Hungary and the outlines of a possible visit to the airport took shape. 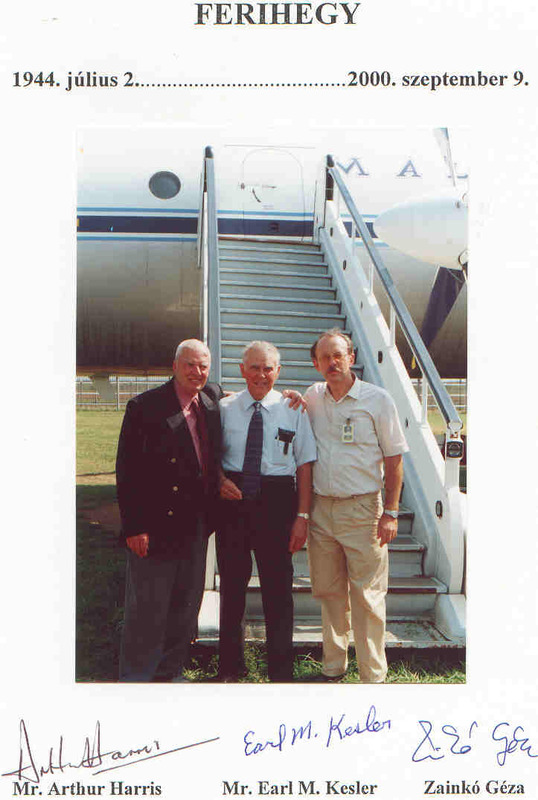 The improvement of his state of health made possible in the year 2000 the journey to Budapest, which was connected with a visit also to Prague, where he wished to see his son who was working there and his family. In the preparations of the program of the visit to Budapest Anikó helped much, who was the one time girl friend of Arthur’s wife. She inserted an advertisement in the local newspaper “NÉPSZABADSÁG” in quest of the doctors and nurses of the wartime hospital. Within surprisingly short time more of them answered. As we learnt it later, it was a fortunate matter of chance that they just red the very issue of this paper or acquaintances called their attention to that. The two doctors occurring Mr. Kesler’s memories: the second wife of Dr. Sukivatí Imiry, (truly Dr. Sukováthy Imre) and the daughter of Dr. Plaschal Louis (truly: Dr. Placskó Lajos) and the niece of Ms. Elizabeth Pintér, head-nurse Pintér Erzsébet, who could has been identified without any difficulties, answered. Upon the unexpected success the organizing work began. The LRIi gave support in the arrangements to the late summer visit to Ferihegy and also in the publication of the booklet treating the event. Ferihegy, September 9, 2000. Saturday few minutes before 10 o’clock a.m. A small group of people assembled in front of Gate „B” to Terminal 1 of Ferihegy Airport. Mr. and Mrs. Kesler, their son and daughter in law and ground daughter. Furthermore Arthur and Ildikó, Anikó, Mrs. Sukiváthy, the relatives of Dr. Placskó and of Head-nurse Erzsébet Pintér. Dr. Károly Martinkó and Levente Sükösd radio reporters as well as the two-men team of RTL Club local TV, who got acquainted with each others. After the arrangement of the entry formalities with professional English interpretation the visit to the airport began. The group of twenty departed with the VIP bus of LRI to the Control Tower via the inner service road, stopping at several spots. 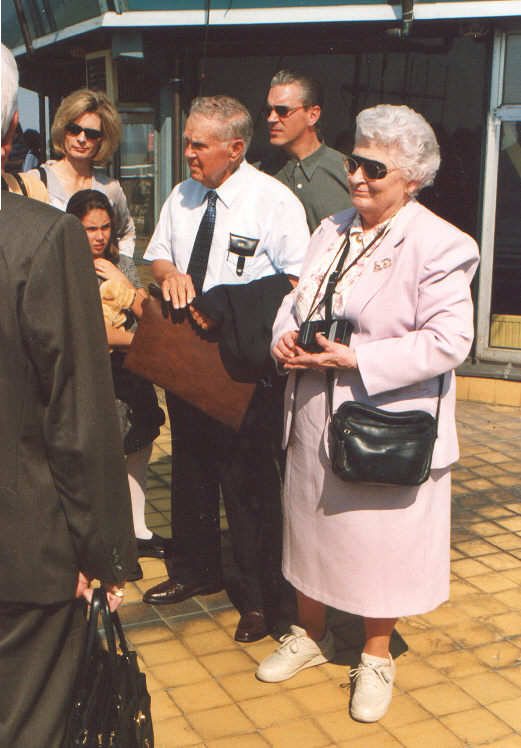 Brief information was provided on the airport, which was opened 50 years ago to 2000, on the terminal building, interweaved with the construction works and the events of summer 1944. At the present-day garden the former farm buildings stand still in their original state. 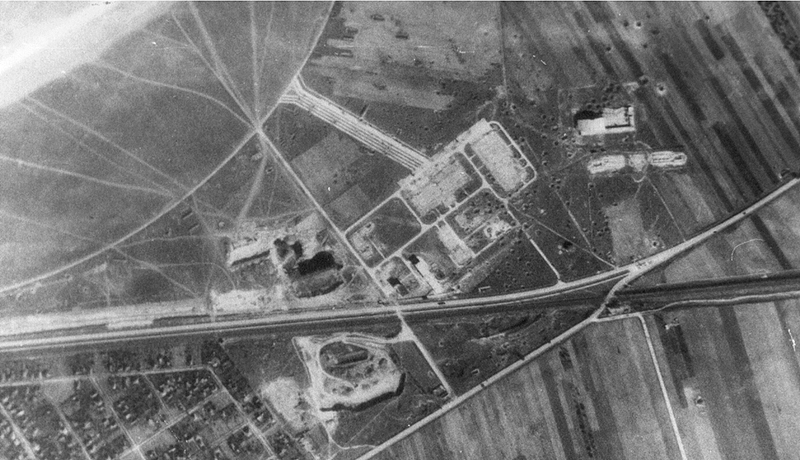 In summer 1944 German long range reconnaissance planes were stationing here, however the ”dog-tongue” shaped stands prepared for them disappeared in the fifties, present day one can observe the old taxiways only in a part. The next stop was the observers’ terrace on the top of the Control Tower located at the highest point of the airport from where outstanding panorama opened omni-directionally at more than 10 kilometers distance on this clear day. By the help of an aerial photo taken in 1950, on which the traces of the former bombings and the RKIii buildings were well visible, I recalled for Mr. and Mrs. Kesler the war time events. The visitors who have never been before at such place followed with attention and with great interest the life of the airport, the twin runways’ traffic, the aircraft at take-off and landing and those being under ground handling at the apron. After this Mr. Kesler and some others were interviewed. The next short stop was at the open air exhibition of vintage aircraft. It was the top of Ferihegy visit, when the minibus arrived at the still existing two former RKI buildings. On the spot where he landed on the roof with his chute the old navigator fell in deep thought as he recalled in silence those remarkable minutes 56 years ago. At that time he got in sight the airfield from far and for few seconds only during the attack, so he did not remember anything else apart from those were put down on the paper. Otherwise, as he has served with this unit for a month then, he had not flown over Hungary before this raid. The former RKI buildings and hardly visible remains were identifiable only with the knowledge of the long past. However from these buildings one stands in whole, but the other in parts only. The ruins of the other ones were demolished before the nineteen-fifties during the reconstruction works of the airport, and the remaining ones in the second half of the seventies. In the times of privation due to lack of building materials, the still usable bricks, timbering, reinforcement rod, glass and many others were used for the reconstruction of the terminal building, the farm house and he hangar. The broken up bricks were carried away to the houses in the vicinity and the broken fragments were used for filling. The remains of the iron-banded cement pillars of the former first twin hangar are still recognizable in the brushwood. The early afternoon ended visit to Ferihegy on Mr. Kesler’s invitation continued at the dinner table. He expressed his thanks to those who made this for him very important visit possible. Special thanks were extended to the relatives of his former saviors and nursing staff for the tender care, for which he might thank his survival in those perilous times. The conversation, which continued till early evening, mostly started in the past and also on the saviors’ side curious life histories became known. With the help of the relatives such events came to light, which however were not connected directly with Mr. Kesler’s story, but anyway are illuminating for the historians of our times. We know very few about Hospital Nr. 11, its documents regarding the doctors, nurses and patients unfortunately are not at our disposal and may well be, those would be available nevermore. His second wife remembered to the former surgeon, later rural district general practitioner: my late husband was born in 1919. His father was an under-secretary of state and as such he moved in high places. There was reference also on behalf of Mr. Kesler to that. 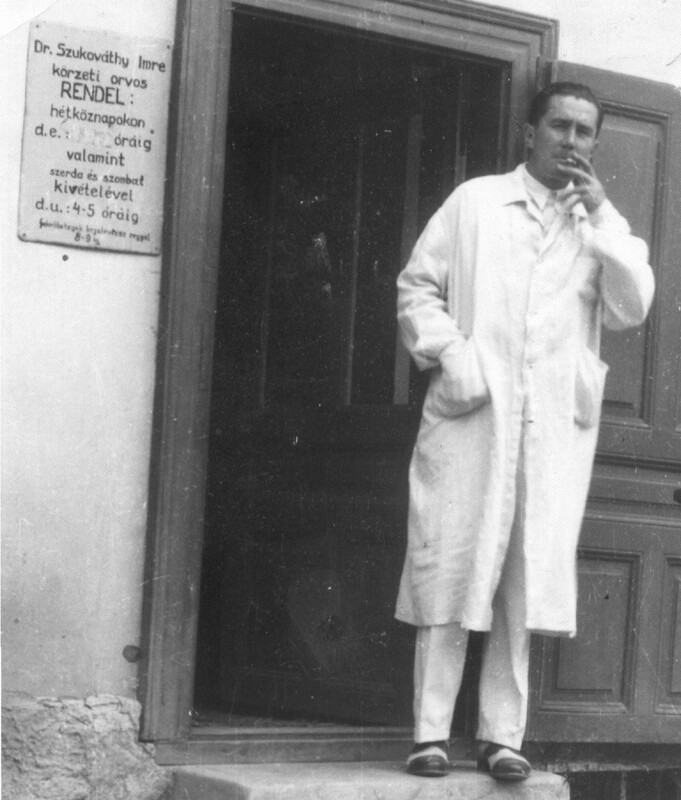 As a young civilian operating surgeon he worked already in the year 1943 at the above-mentioned hospital, where among others he worked with Peter Csató, Chief Surgeon, who was some 10 years older than Imre, and he was the Head of Department. As an English speaking man, he was able to establish easily personal relations with the wounded American airmen. He told me about Mr. Kesler and his fellow soldiers several times. However he treated also other patients but Mr. Kesler was the one, who was set on his legs again with the help of the adventurous way acquired medicine, the penicillin. In the years followed after the war his fate was the privation and forced translocation to the country. He worked at Girincs village in Borsod county, but also four other settlements belonged to his district. Time after time he wrote letters to the pilots, he saved addresses from some of them, but he received no reply. May it be, that those letters never ever have left this country? He suffered a fatal road accident in the discharge of his duties in 1972. My friends called my attention to the ad in the newspaper and I was very glad to meet the man, who was however an enemy at that time, my late husband restored him to life. He was born in 1919 at Ózd town as descendant of a medical doctor. Med. Univ. Doctor degree was conferred on him on 25th September, 1943 and he worked then in the St. John Hospital where he carried on research work for liver cancer. From 1st June of 1944 he did his military service in Hospital Nr. 11 and there he established friendly contacts with the airmen who were taken into this place. He spoke fluent English and by way of his humanitarian thinking he cured his patients not only with medical treatment but also he was giving them moral strength for recovery. Teasing them in the ward he called the American airmen as “American gangsters” (as they were called in the newspapers that time). He got married in 1945, and he worked in the surgical division of St. Rókus Hospital. In 1948 he was arrested and charged with espionage in the Regéczy Nagy Imre case. In the trial he was sentenced to death at first instance, than his punishment was mitigated to 15 years in prison. He spent three years from this in solitary confinement. He had to give up his old dream of surgery, but he worked as med. 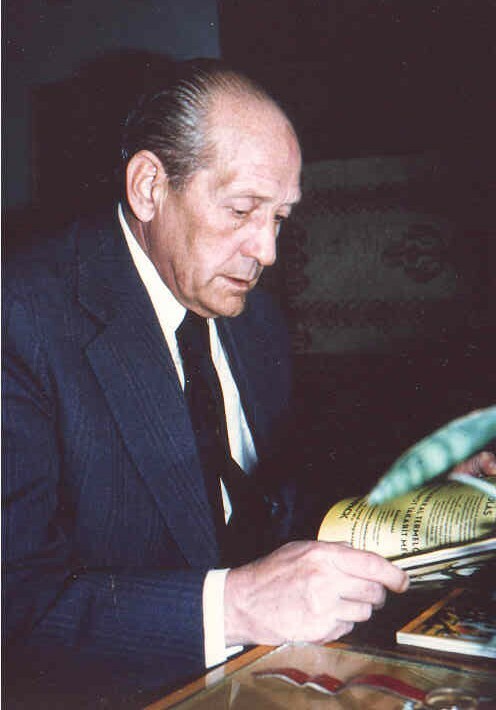 doctor even after his retirement in 1989, however he became seriously ill and past away in 1992. The imprisoned years left indelible impression in his life, however after the political changes in 1989, he was re-established in public esteem. In 1990 he was awarded to honorary citizen in Putnok town. In a closed friendly circle and in the family the epoch of his life, when he treated the Anglo-American airmen was well known. His daughter Klára remembered to the outstanding medical doctor. My Aunt was already 39 years old in this time – said her niece – and she served in the Hospital as voluntary nurse. She told many times about the wounded, burnt American pilots. As I new her, she helped everybody in need. Probably this was the reason why Mr. Kesler remembered to her so well. This way came to an end on 9th September 2000, the story, which had begun 56 years ago, on 2nd June, 1944, in which drama the characters were of the same age, twenty-something, and even if they were in opposite side in the war, nevertheless their life were interdependent. The few minutes long radio report was broadcasted yet next day at 7 o’clock in Sunday morning by Kossuth Radio.iii This was in accordance with the facts. In the TV RTL Club the movie of the Keslers’ visit was on two days later, next Monday in the evening “Focus” program. 1 LRI= Air Traffic and Airport Administration, the operator of Ferihegy Airport. 2 RKI= Repülő Kísérleti Intézet – Experimental Aviation Institute. 3 Main Hungarian public radio station.